Dinosaur Fossil Skulls Replicas! Create Dinosaur Dig Game to dig favorite fossil skulls from Jurassic World at your backyard! 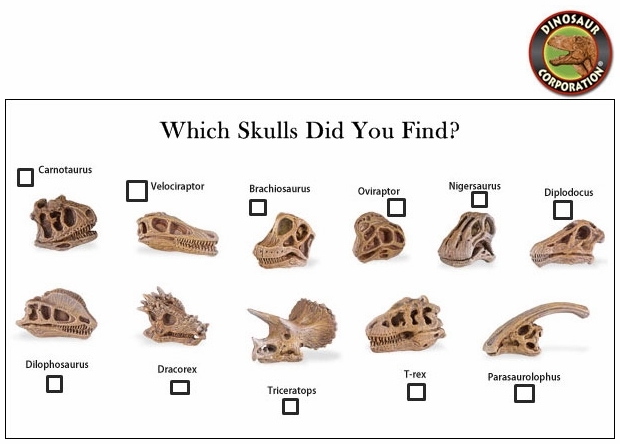 Kids will love this dinosaur game idea - I Dig Dinosaur to discover skulls of Carnotaurus, Velociraptor, Brachiosaurus, Oviraptor, Nigersaurus, Diplodocus, Dilophosaurus, Dracorex, Triceratops, Tyrannosaurus, and Parasaurolophus. ▪ Jurassic World Deluxe T-REX Dinosaur Birthday PHOTO Banner 60"
Jurassic World Deluxe T-REX Dinosaur Birthday PHOTO Banner 60"